The Correllian Nativist tradition is one of the largest and fastest growing Wiccan traditions in the world! Approachable and informative, this three-volume teaching series will prepare you for initiation into all three degrees of Correllian Wicca. Book one introduces Wicca as a spiritual path and what it means to be a witch. In twelve lessons, you'll learn about magic, ritual, invocation, divination, energy work, crystals and more. From magical alphabets to advanced energy working, the second volume builds upon this foundation and also discusses the duties of second degree clergy. Every lesson in these first two volumes highlights a deity and a spell, and features study questions, a glossary, and exercises to develop your psychic and magical skills. 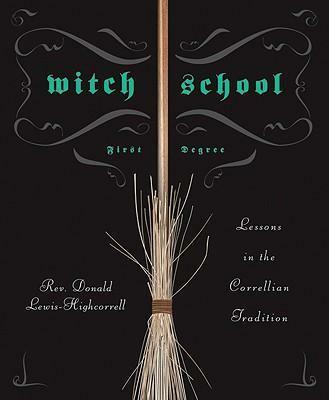 "Witch School Third Degree" is for those who are called to Wicca as a vocation. This text explains the responsibilities of the High Priesthood and the challenges and needs of the Wiccan community. You'll also explore the mysteries and spiritual concepts such as astral travel and shapeshifting, the nature of the soul, the nature of time, the Ennead, karma, past lives, and conscious incarnation and evolution. Rev. Donald Lewis-Highcorrell (Illinois) is First Priest and Paramount High Priest of the Correllian tradition. As Chancellor, he is responsible for the day-to-day running of the tradition. Rev. Lewis-Highcorrell is also a co-founder and officer of the Pagan Interfaith Embassy, serving as Pagan Interfaith Ambassador to the U.S. Over the years, he has edited several magazines, including The Round Table magazine. He has also co-hosted Chicago's "The Witching Hour" radio program and appeared regularly as a guest on the "Telepathic Radio" program.